Lets you use a little of each grit without buying the larger packs. PLEASE NOTE - These sheets are too small to be compatible with the rubber sanding blocks. This size and assortment was designed for use with touch up paints where larger sheets that we recommend with aerosols are not desired. 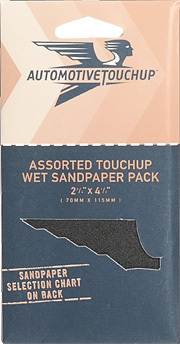 It can be used with other finishes too as long as the repair area is small. These sheets are small so they are not compatible with the rubber sanding blocks. For help understanding the different grits and grades of sandpaper, visit our sandpaper selection chart.